The US Company ‘Terrafugia’ claims that its TF-X will be ready to fly in years to come. According to Massachusetts-based Terrafugia, this prototype is expected to get ready by 2018, and then it will be presented for public for sale. Today traffic is the major issue, but commuters would be at ease in near future when these flying cars will be made public. The company’s designed prototype has fold-out wings with thin electric motors attached to each end, and will be operated by a 300 horsepower engine. This vehicle will move with a speed of 322 kilometers per hour with a flight range of about 805 kilometers. This TF-X will be semi-autonomous, so that the passengers siting in it simply enter where they want to go. It has space for four passengers. The possessor will need a driver and a special driving license. The company says that the TF-X operator will have final say over whether the consented landing zone is a safe place to land, and they may terminate the landing attempt at any time. The prototype was revealed at the Experimental Aircraft Association's annual fly-in in Oshkosh, Wisconsin. 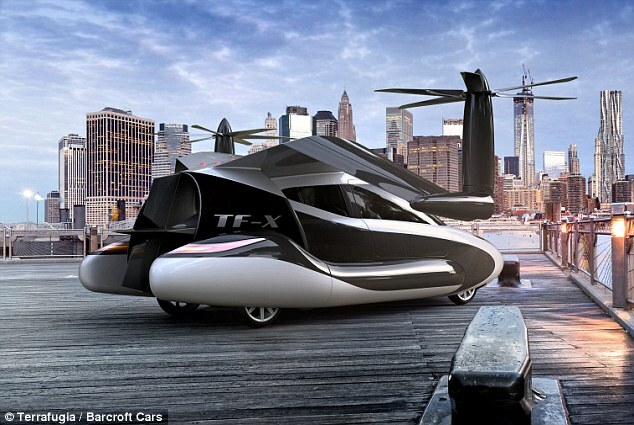 Last year the company unveiled a flying car- Transition, accommodating 2 passengers, costs about $261,000.